About the author: Lyndon Baines Johnson (August 27, 1908 — January 22, 1973), President of the United States. See his biography in the Lyndon B. Johnson Presidential Library website. 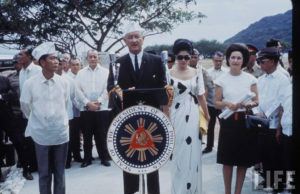 The entries included in the Philippine Diary Project comprises the dates October 23-26, 1966, the days when Johnson was in the Philippines to attend the Manila Summit Conference.